Situated on the coast between Porthcurno and Lamorna on the far West of Cornwall is nestled this fine 3 storey cottage built from vernacular materials in the mid 90?s. Lilly Lewarne’s brief was to extend the property to the South West and create a contemporary addition that whilst contrasted in aesthetics complimented the rough ruggedness of the original build. Having gained planning permission early in 2016 work began on site with Davey Construction in this remote part of the county in April and is due for completion in February 2017. The cedar cladding is designed to silver over time blending in with the surrounding context whilst providing an excellent family home. 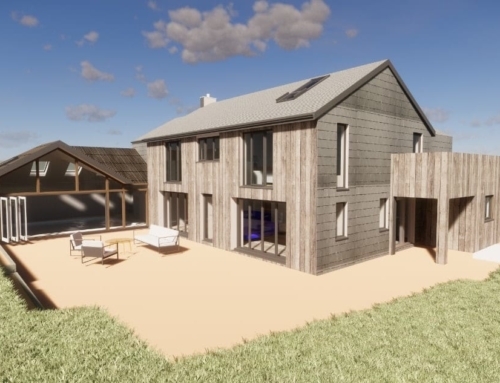 Lilly Lewarne Architects In Cornwall are a Chartered Architectural Practice based in Truro, Cornwall. All Saints Church, Highertown set out to raise funds for new community hub in Truro, Cornwall!